Thailand is home to rich history, bountiful cuisine, picturesque beaches, mountains and scenery. It is a veritable treasure trove of discovery and peace for any individual hunting for an adventure or an escape from everyday life. The downside of it being a treasure trove is that people never know what is absolutely a must do and what can be left over for later visits especially in Chiang Mai. So here are 6 tips for tours in Chiang Mai. The Bike tour is one of the best attractions available in Chiang Mai. Any individual who is looking to get away from the hustle and bustle of city life should definitely sign up. This Bike tour takes you on a two-wheeled off the beaten path adventure. You become surrounded by fresh air, greenery and a wide horizon while also coming across little town where you can stop to eat and buy trinkets to keep. Also called the Roof of Thailand, as it is the highest peak of the country. 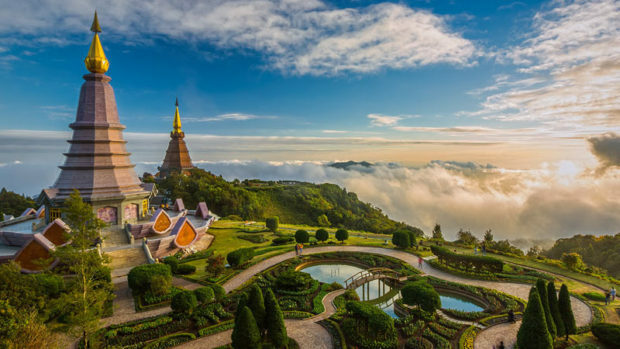 The national Park tour preserved in honour of a great olden king holds many sights including Wat Phra That Si Chom Thong, Wachirathan Falls, jungle trekking at Aang-Ka (Michael’s Trail) and Phra Mahathat Noppholbhumisiri. This park is home to many of the wild life creatures as well and tourists are always lucky enough to get up close and personal with these beautiful animals. Thailand is known for its absolutely scrumptious foods and the Chiang Mai khantoke dinner provides you with the absolute best followed with a beautiful and poignant cultural dance that takes your break away. If you are a thrill-seeking individual the “Flight of the Gibbon” is the absolute best place for you. Situated deep in the forest a series of 30 platforms with 18 zip lines running between them. This adventure includes a hike up to the Mae Kampong Falls as well making it even more irresistible. The Chiang Mai Night safari tour includes provides an exciting adventure walking through the natural habitat of various creatures during the quiet night. This tour allows you to see the animals in a way that you may never have seen them before. The tourists are completely safe at all time as they have their own fellow guides whom are quite apt at handling any situation that may arise. Last but not least the Mae Ping river experience is something that no tourist visiting Chiang Mai should miss. This tour takes your through the inner sanctuaries of the city where you discover historical temples and monks, like the Songthaew to Wat Chai Mongkon temple situated at the bank of River Ping. Along with the cruise of the actual river, which is quite delightful the tour also includes a visit to Warorot Market; the largest market of the city as well as the Ton Lam Yai flower market.